Healing, hope, and empowerment happen when we remember we are whole and holy. Each life experience, each moment, is another puzzle piece offering us an opportunity to reclaim a place where we have forgotten our wholeness. Life is an infinite opportunity to remember. Qoya is based on the idea that, through movement and through feeling, we remember. 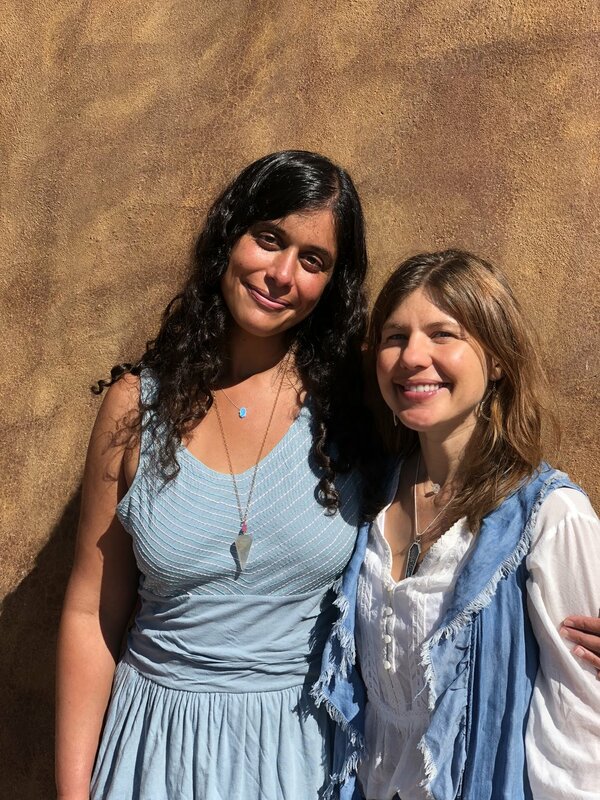 Whether you take a Qoya class in person, through a video online, at a retreat, or simply dancing to a song in your living room, the invitation is to softly surrender into noticing what is right in front of you by feeling how you actually feel. Noticing how you feel is important, because this is the bridge into the present moment of embodied authenticity. Embodiment empowers you to navigate the path of evolutionary change with resonance, integrity, and faith in the process. There is a teaching about life being like waves in the ocean. When things are good and the vibes are high, enjoy and savor because it will change. Similarly, when things are challenging, embrace whatever the lessons are and know that this too will pass. The idea is to remember that the only constant in the outer world is change, and everything that comes into the world will also leave. It takes immense courage to dream. You must be willing to expand your faith to hold a vision of possibility becoming a probability. At the same time, you must hold space in your psyche that if this dream does not manifest in physical form, you will be ok. Fear of disappointment is often what holds us back from moving in the direction of our dreams. Wishing you a heartfelt happy new year. For those who wish to jump into the ocean of collective consciousness during this new year, new moon, and partial solar eclipse, there are waves of enthusiasm, awakening, and positive energy for you to ride into the shore of 2019. This intuitive wave of energy is asking, "Are you wiling to commit to your intention?" Can you relate to the tendency of modern living where the body does one thing, the mind is somewhere else, emotions are fluctuating, and the spirit is in its sacred space somewhere completely different? Part of practical living with awareness is about creating congruence for your body, mind, heart, and spirit to be clarity and integrity with one another. What would your life look like if you believed this was possible for you? What would it feel like in your body to devote yourself in embodied prayer and action to this vision? 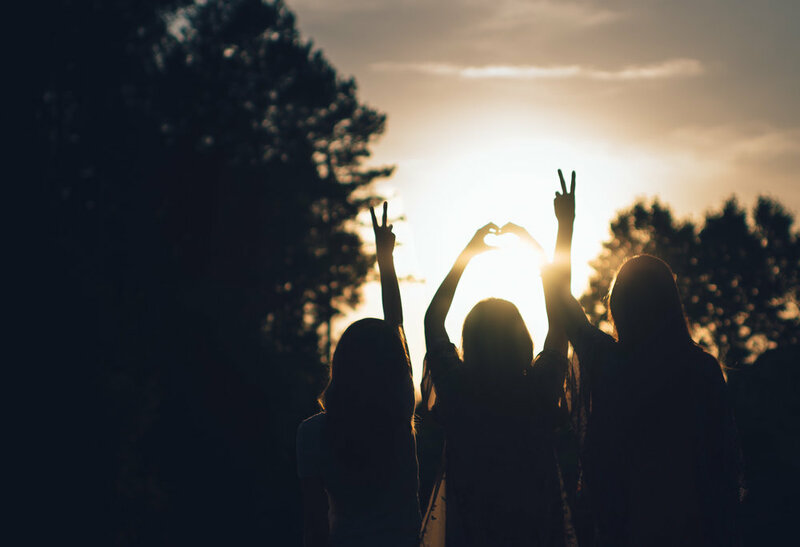 In personal growth communities, we often practice peace and surrender. Yes. Great tools for many times and situations. However, if there is an incredibly large gap between the vision in your heart and the reality of your external world, I invite you to consider this could be a time calling for your committed action. I have this conversation with many women who say that they want something, but they're "not attached and trust the universe." If that's true, great. However, if as you say it, your heart aches because it's not true, I wonder what it would be like to give yourself permission to really align with the soul call you feel. The thing that brings vitality to your being. The thing that if there was a successful completion of, you would feel like it was less about accomplishing a goal and more about facilitating a soul retrieval for yourself. The place where you recognize that because the desire is so big, so are the stakes and the resistance. As I write this, I'm having a flashback of a lighter example when a woman told me her dream was to be able to do splits. I asked her, "Do you practice?" She looked at me confused. I asked another way, "Do you stretch?" She seemed still bewildered as if there was a correlation between her desire coming to fruition and her own active participation. What happens when you measure the distance between your intention and your commitment? The New Moon on January 5, 2019 (8:28pm EST) is a partial Solar Eclipse in Capricorn. Eclipses mark major turning points, and their influence lasts for 18 months following their initial occurrence. The new year begins on a serious note. If ever there was a year to set intentions, this is it! There are moments in life when we feel ready to move on - to leave the past behind and set ourselves to the task of building more of what we want. This Moon is one of those defining moments. It is a time when we are pressed to dedicate ourselves more fully to be the owners and authors of our lives. The world is influenced by those who show up. This Moon asks us to show up, to make commitments, and to set up structures that will support us in seeing them through. There are so many things that can distract us from the essence of why we are here. Other people and society try to define ambitions for us. If there was no one you needed to impress - no external expectations to live “up to” - what would you spend your time doing? What would you work towards? What is your true calling? Looking back at the year past, is there anything you wish you did less of? Time is our most valuable resource, and this Capricorn moon requests that we use our time wisely. Work smarter, not harder. Uncomplicate your goals and make them attainable. Remove waste and excess so you can focus on what’s most important to you. Looking at the year past, is there anything you wish you did more of? When you take away external validation, what does success mean to you? We can all be successful. The more we embrace our own mountain - the one we were born to climb - the more we inhabit our integrity and pave the way for others to live their purpose, too. Something is calling you toward it. Listen. Then place your feet on the Earth and go after it. Qoya is based on the idea that through movement, we remember. We remember our essence is wise, wild and free. Remembering the essence of who you are can be very helpful in conjuring the courage to commit to your truest calling. When we are talking about intention, it is often to bring something from an idea into a physical reality. Therefore, I find embodiment is one of the most powerful tools in calling energetics into form. The first movement in a Qoya class is intention setting. 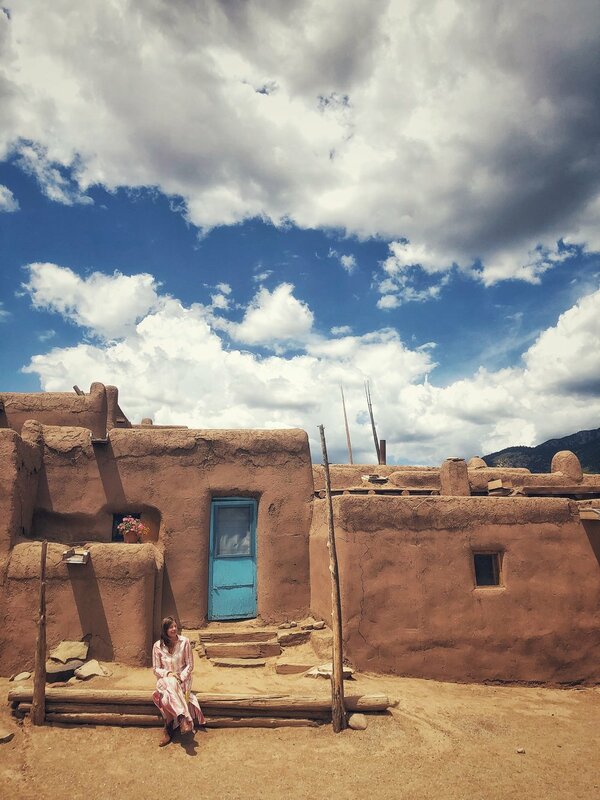 This is where everyone is invited to come into the present moment by connecting with their breath. It can be very difficult and uncomfortable at times to transition the mind from judging, analyzing, and planning into the intelligence of embodied lived experience. Once connected to the present moment, we invite an intention to come in and then repeat it like a mantra, inhaling while saying silently, "Today I am dancing for..." I encourage people to do this 3-5 times to become clear and steady. The challenge is the wandering mind, where one may set an intention but instead of staying with it, starts the cycle of distraction or daydreaming. We anchor our intention in our bodies by planting the intention like a seed in our hearts and pausing for a moment to feel the tender vulnerable place of acknowledging our desire. Next, we plant our intention into the unique time and physical space where we are. Lastly, we plant our intention like a seed in the earth. Just like one would plant a seed in soil and begin a collaborative growth experiment and just like so many seeds that are planted in the earth grow and nourish us in this world, we offer a prayer that this seed also be supported on its path of manifestation. 1) Commit to your intention by first slowing down enough to be present to it. 2) Listen for what that call is and then set your intention! Here are two separate videos for you to explore tuning in and setting your intention. Oftentimes in Qoya classes, we encourage the intention to arise organically in the moment. In the spirit of commitment, my suggestion is at the beginning of your day or daily practice, you set the same intention as a grounded gesture of devotion to your soul's path. Self reflection time: How committed are you to your intention? For those who are truly seeking movement in their life, I encourage you to explore adding more movement in your life. The circulation of blood, oxygen, and energy will continuously cleanse what is ready to be released, ground you into the gifts of the moment, and remind you of the importance of taking time to dream. Pick a reasonable goal - something you can succeed at - and whether it is Qoya, yoga, walking or any other movement that feels good in your body, I wish for you to honor the part of you that is ready to commit on a consistent basis to your intention and reclaim the power you hold to co-create in the world. May this new year, new moon, and partial solar eclipse support you on your path! To continue diving into the energy of this Capricorn moon, you may also be inspired to check out the Embodied Astrology: Capricorn course which includes an introductory video to give you an overview of Capricorn's aspects, a Qoya Movement Ritual so you can embody your own personal relationship to Capricorn, an integration video with an exercise to apply in your life, worksheets with journal prompts, and a blessing for deep reflection. One of the most interesting aspects of my work is that I have the honor to ask and answer questions with others about what truly nourishes our bodies, minds, hearts, and souls. In Qoya, we explore this most often through movement, then also ritual, community, and pilgrimages. Some of the most common themes that emerge are: what is the balance between being able to function in this world but not be bound by it? How can we trust and follow what feels resonant while maintaining the relationships that are necessary in our families, businesses, and society? How do we manage our schedules being pulled in so many different directions while still staying true to where our hearts are calling us forward? The answers are different for each person and different during different cycles of life. The navigational tool is becoming well-versed in how to access your inner wisdom, cultivating courage and confidence to express yourself authentically, and then expanding your capacity to prioritize nourishment. My hope is that every Qoya class strengthens each person's ability to do this. For many of us, there’s often a soul ache when we measure the distance between what we felt called to do and what we accomplished. While there's always an invitation to celebrate, there is also an invitation for honest self-reflection. As we approach the space between the solstice, the ending of the past year and the beginning of a new year, what emerges as you reflect on your journey? How did you prioritize what is most important to you this last year? How did you not prioritize what is most important to you this last year? How will you prioritize what is most important to you this next year? How are you concerned you will not prioritize what is most important to you this next year? Are you wiling to take time to reflect and write down to the answers to these questions? The Full Moon in Cancer on December 22, 2018 (12:48pm EST) holds the keys to deeper self-integration. There is a new task approaching. In order to access these assignments, we must align and center ourselves within our own integrity. What purpose have we come here to fulfill? During this past moon cycle, we have been steeping in dreams and visions. Our visionary talents have been stoking questions of what we want to do and who we want to be in our next chapter. As we sift our dreamings, we encounter the vulnerable elements of our own will. In order to accomplish what we came here to attend, we must integrate the ways we withhold or misdirect our energies. We must heal our impotence. We must own our desires. We must stand with compassionate strength for what we want, choosing to move forward with fierce grace. We must embrace that anger and fortitude can energize the accomplishment of necessary tasks. This Moon offers clairvoyance, open sight, opportunities, and fortunate news. Commit to protecting and nurturing that which is held most dear. Give yourself to fostering what feels most important. Embrace yourself as a parent to what you seek to cultivate in the world. Dedicate a space in your heart and in your life to tend that, without distraction. How do you set yourself up in your life to embody the clarity and commitment you pray for? For me and for many others, our feeling of connection to our deepest truths and ability to integrate them into our lives has a direct correlation to our feeling of connection with our bodies and the earth. One of the easiest ways to wake up to our deeper callings is by coming into our bodies and attuning to the powerful messages of the earth that are always around us when we remember to look. In this slower time of the winter solstice and the pause that can often happen at the end of the year, how will you listen more deeply? If you were able to prioritize what is most important to you, in what ways can you imagine your new year would be truly NEW? I offer you something to contemplate if it resonates for you. It's the phrase: Nourishment First. There will always be distractions from your vision. Some pleasurable. Some obligatory. In the face of both, how do you truly prioritize what is most important? Perhaps you can find a way to do that first? Trust that all the other aspects of your life will find a way to get done, since you probably already have great capacity to manage them. However, where are the places calling for your attention, asking for growth? Where are your instincts less activated to aligning with what serves you, so you can be of most service to the world? How can you commit to the things that are the most nourishing first? If you are reading this, there's a chance that you feel the soul call towards prioritizing movement, and that that is part of your path. I invite you to dance with me today to this video called: Nourishment First: Prioritize What's Important. It's a simple video to set an intention, circle through each part of your body, embody your intention with some gentle yoga sequencing, and then shake out anything that keeps you from staying connected! I also offer the experiment to track how other aspects of your life arrange themselves when you are nourished, in whatever way nourishment appears for you now. For some, it is rest. For others, it is creative projects. Or maybe your business projects. Whatever nourishment is for you, I wish for you a deep honoring of all that you have created and received in 2018 and a prayer that in 2019, there's an expansion of perspective where you feel more reflective harmony between your inner desires and the dance with your outer world. Thank you for being part of our global Qoya family in 2018. Every single moment when one of us remembers our true essence and can feel the physical sensation of our spirits animating our human bodies is a gift. Whenever we dance in that direction and in those sacred moments when we arrive, may we feel the pulse of people courageously dancing before us, alongside us, and the pulse of those who will come after. P.S. For those of you who live in or have access to Los Angeles, I invite you to join me for a class in Venice, California on Saturday, January 5th from 3:30pm - 5:00pm with the theme Remembering the Future. To continue diving into the energy of this Cancer moon, you may also be inspired to check out the Embodied Astrology: Cancercourse which includes an introductory video to give you an overview of Cancer's aspects, a Qoya Movement Ritual so you can embody your own personal relationship to Cancer, an integration video with an exercise to apply in your life, worksheets with journal prompts, and a blessing for deep reflection. 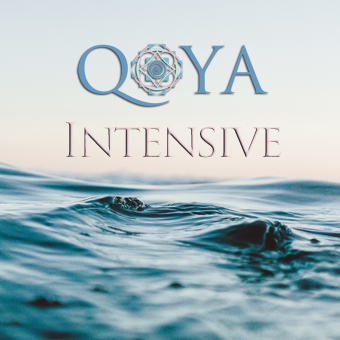 For the first time ever, Qoya founder Rochelle Schieck is offering her level 3 Intensive teacher training online with the intention to make Qoya teacher training accessible to women who are unable to travel in order to complete their Qoya teacher training. "If we want to fully experience love and belonging, we must believe that we are worthy of love and belonging." The focus in Qoya is to encourage people to trust the physical sensation of truth in their bodies, because it's incredibly common for people to go against their truth and mentally rationalize why they can't authentically act in a way that resonates with their true mind, heart, body, and soul. Most of us grapple with cultural conditioning that there's not space for us to be loved and belong when we're true to ourselves. When we are in pain ourselves or are empathically attuned to another's pain, it's normal to experience suffering. Often, healing occurs when we remember our alchemical potential to transform our pain into purpose, our suffering into service, our confusion into trust, our fear into love. The words seem trite if all you do is read them, but if you reflect on a moment when you truly transitioned from the ego's perception of lack into the soul's love of growth, you might be able to relate. Transformation is non-linear. Healing takes as long as it takes, and some paths are more efficient than others (and more enjoyable). My prayer has always been that Qoya supports individuals and the collective to remember our essence, our essence that has the presence to heal. 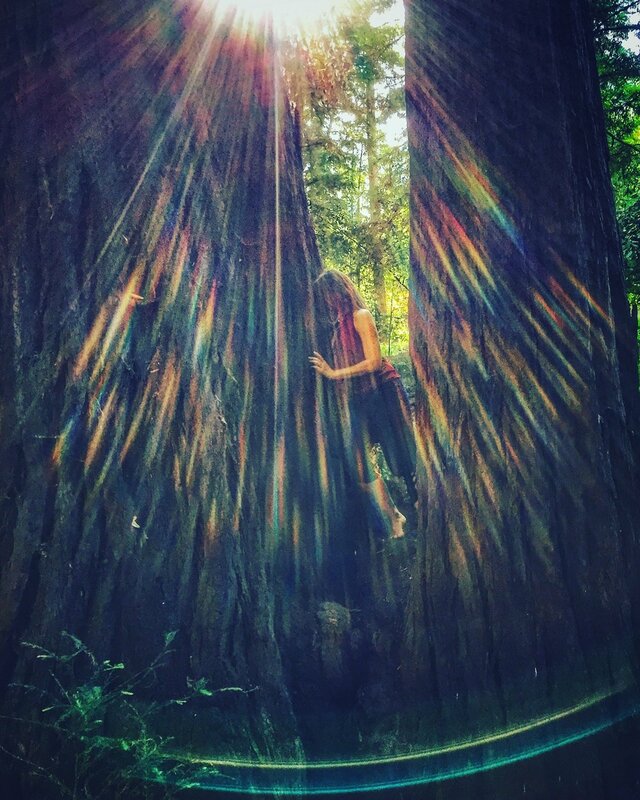 I had the honor of leading something called the Women's Transformational Weekend with Movement, Dance and Ritual at Multiversity 1440 this weekend amongst the old growth redwood trees. As we began together Friday afternoon, I faced many contemplative and somber faces of women who couldn't help but feel the collective weight of the world on their individual shoulders. It's challenging for many to watch an antiquated narrative that blames and disbelieves women play itself out and reflect the experiences we've had with that toxic energy. The gift was that we were together. While it's normal to doubt, there is one interesting thing to notice about its source. Doubt is most often rooted in the repetitive thought patterns of the mind. These habitual forces are like a strong wind with the power to shift you from the place of center when you feel the most authentically yourself. Those moments, when you feel the most authentically yourself, also have a usual source. Authenticity of being is most often rooted in the full embodied experience of the Self in the present moment. It's a feeling. An awareness. A presence. A blessing. This experience is fleeting if dependent on external stimulus, but so much of the human journey is about learning how to make the experience of being your true self become the source of your thoughts, feelings, beliefs, and actions. Each of our journeys are unique. One of the keys to healing is the same desire innate to the human condition yearning for freedom: the power to choose. Some of the more interesting dynamics of this are when our freedom increases because we decide to no longer hold our own energy back. By developing, strengthening and honoring the truth of how we feel in our body, we are more able to flow with the truth of our own life force. The Full Moon in Aries on September 24, 2018 (10:53pm EST) is a dawning. It is a sign of the Self. Not simply the self you know, but also the emerging Self. The You that is generated from being awake and attuned to the leading edge. The leading edge is an undiscovered place, and because of this, we may not deem it a safe place. Our sense of security may be challenged. We may wonder if we’ll be alone in this unknown place. Unmet. Feel those sensations, and go forth anyway. It takes tremendous courage to pursue the proddings at this edge. At this stage, if we are going to heal, pursuit and decisive action are the only options. We are required to summon strength and shed veils of false peace and complacency. Something new is unfolding. We are living in unprecedented times. And we are here for it. We are motivating, integrating, and showing up to help lead ourselves to a future home. Active participants, recipients, and makers of this revolution. Each of us is called to rise. We are called to live into our part of the leading edge. In doing so, we will piece together a new wave of harmony. The answers to old questions are changing. And so, we ask them again: who am I? Why am I here? With all the love in my being, what am I willing to fight for? To make this shift from doubt to confidence is often to make the shift from identifying with our thoughts alone to feeling our soul embodied. From that aligned place, notice what thoughts emerge. What is the easiest way to align with that feeling? I'm biased here, but I'm going to go ahead and say again: movement. There's only one way to know if it works for you, and that's to do it. Wishing you an empowered experience of yourself with the equinox, full moon and the emergence of truth that is happening within each one of us each and everyday. 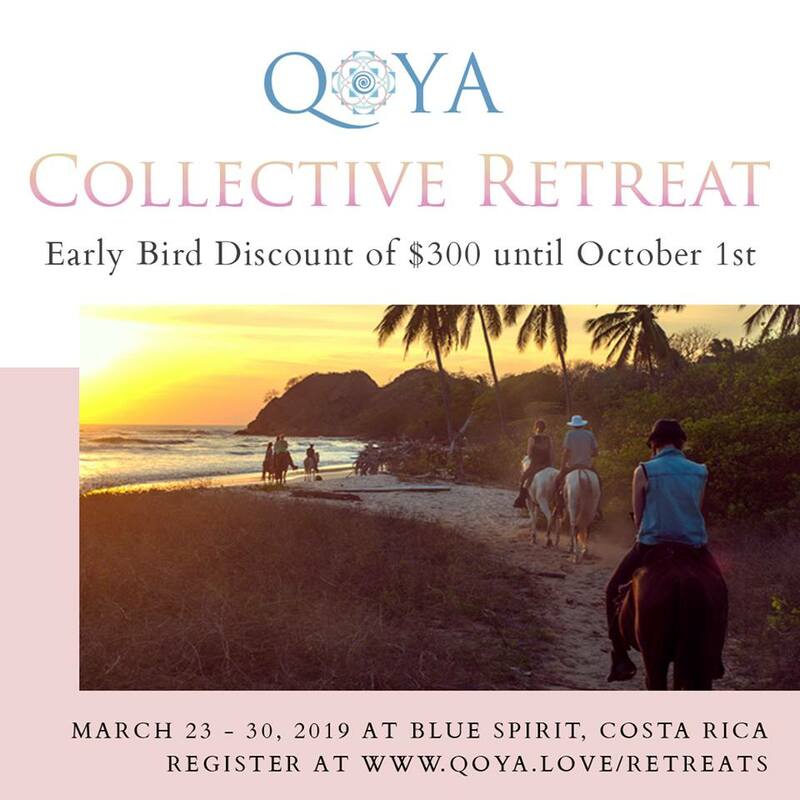 There's one more week to take advantage of the Early Bird Discount for our Qoya Collective Retreat at Blue Spirit retreat center in Costa Rica on March 23 - 30, 2019! 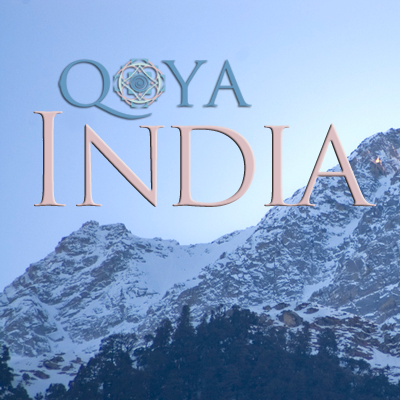 This retreat not only celebrates 10 years of retreats at Blue Spirit, but it is also Qoya's 10th birthday celebration! Now through October 1st, save $300 off with the code CONNECT. 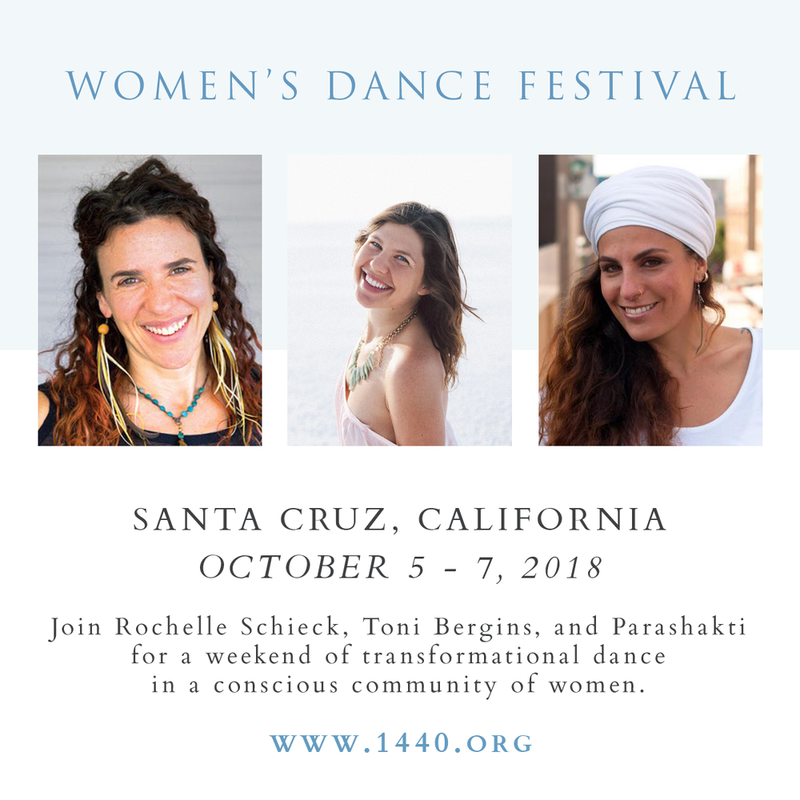 Join forces with Toni Bergins, MEd, of JourneyDance, Rochelle Schieck of Qoya, and Parashakti of Dance of Liberation. This powerful collaboration of evolutionary soul transformation calls you to gather on the dance floor and remember the truth that lives in the wisdom of your body.